Sweet corn, believe it or not, is actually a whole grain—it's a type of grass that is often referred to as a starchy vegetable because of its carbohydrate content. You will often hear whole corn is referred to as a vegetable, whereas ground corn is referred to as a grain. Sweet corn is indicative of summer, which is its peak season, most often served as a staple food at barbecues and outdoor cookouts. Although corn contains carbohydrates, it is good for you. In fact, corn is rich in vitamin C, magnesium, B vitamins and carotenoids, such as lutein and zeaxanthin. Corn contains very little fat, less than 1 gram per serving (without toppings), and is a good source of ​​fiber, clocking in around 3 grams per half cup. You can fit corn into your meal plan by watching your portion. One small ear of corn contains about 85 calories and 19 grams of carbohydrate, whereas one large ear of corn may have double the amount of carbohydrates and calories. Therefore, if you are eating whole corn stick to a small to medium sized ear. If you are eating corn kernels, aim to keep your portion to about a half cup serving. If you are not eating any other starch at your meal, eat one cup instead. Corn is a good source of fiber, containing about 3 grams in a half cup serving. Diets high in fiber can help to lower cholesterol and regulate blood sugar and weight control. In addition, corn is a good source of vitamin C, magnesium, B vitamins, and carotenoids lutein and zeaxanthin. Vitamin C is important in cell repair, boosting immunity and has anti-aging properties, whereas, B vitamins are important in energy metabolism. Magnesium is important for nerve conduction and muscle contraction. Carotenoids, lutein, and zeaxanthin have been shown to have antioxidative properties and are important in eye health. Should I worry about high fructose corn syrup? High fructose corn syrup is derived from corn syrup, which is made from extracting corn kernels and treating them with an enzyme to make a thick, viscous syrup. High fructose corn syrup differs from corn syrup in that some of the glucose in it is converted to fructose enzymatically, making it sweeter, whereas corn syrup is 100 percent glucose. Some corn syrup has high fructose corn syrup added to it, but that will be listed on the ingredient list. Both types of syrup keep products moister and fresher longer. In addition, both types of products are refined sugars that should be used sparingly, as too much sugar has been linked to a host of medical conditions, including obesity, pre-diabetes, metabolic syndrome, type 2 diabetes, heart disease, and cancer. The reason that high fructose corn syrup gets such a bad wrap is that it is made up of fructose, a monosaccharide, that is sweeter than glucose and metabolized differently. Fructose is metabolized by the liver. When the liver gets overloaded, it turns fructose into fat. Some of the fat can get trapped in the liver, contributing to fatty liver. Excess amounts of high fructose corn syrup have been linked to insulin resistance, metabolic syndrome, obesity, and type 2 diabetes, to name a few. While high fructose corn syrup isn't the best sweetener, it is important to note that all added sugars, sucrose, honey, agave, maple syrup, etc., should be consumed in small amounts. Whether you are looking to lose weight, prevent disease or simply feel good, limiting all types of added sugars in the diet is important. Isn't most of our corn genetically modified? According to the NON-GMO Project, "there are 142 different events (types) of genetically modified corn, the most of any plant species." Most of this corn is used to feed the animals we eat. Fresh corn is not usually genetically modified, but if you are uncertain and want to eat only non-GMO corn then purchase organic. Organic, frozen corn will list on the label that it is non-GMO. Can I eat corn raw? Absolutely! It's actually crunchy and sweet. All you have to do is cut the kernels off the cob and incorporate in salads or other favorite dishes. What is glass gem corn? Glass gem corn is a multi-colored corn that became an internet phenomenon in 2012. Resembling colors of the rainbow, this corn comes in all shades. The corn was originally cultivated by a farmer named Carle Barnes who is half-Cherokee. In his explorations, Barnes collected ancestral types of corn that had been lost to the tribes in the 1800s. He exchanged seeds from people all over the country, replanting seeds of exceptionally colorful cobs. The result? Rainbow colored varieties, ranging in color from reds and purples to greens and blues. Barnes ultimately shared his seeds with another farmer by the name of Schoen. Schoen planted the colorful seeds next to regular varieties which created even more vibrant colors. The name 'glass gem' was given to a specific pattern of corn which is blue-green and pink-purple in color. Due to expansion, glass gem seeds can now be purchased online on the Native Seed/SEARCH website for $7.95 per packet of seeds. If you google the term you can also find other seed distributors—you can even purchase on Amazon. Each packet has approximately 50 seeds which yield around 100 to 150 ears of corn per packet. Planting and harvesting your own glass gem corn is part of the fun because the color varieties are often a surprise! Unlike corn on the cob, glass gem corn, otherwise known as flint corn, isn't eaten off the cob. It's mostly ground and used for tortillas or popped as popcorn. However, when using it as the latter it won't come out rainbow colored. Glass gem corn can also be used for decoration. It is beautiful as a centerpiece or part of a cornucopia setting for Thanksgiving. Variation in nutrition content is minimal. Corn on the cob is available fresh or frozen and canned corn kernels are available canned or frozen. Choose fresh corn that has firm, small kernels. Skip those with mold or decay at the tip of the cob or brownish silks. If possible, it's best to eat corn right away, but if you have to store it do so in the refrigerator. You can also freeze it, even on the cob. 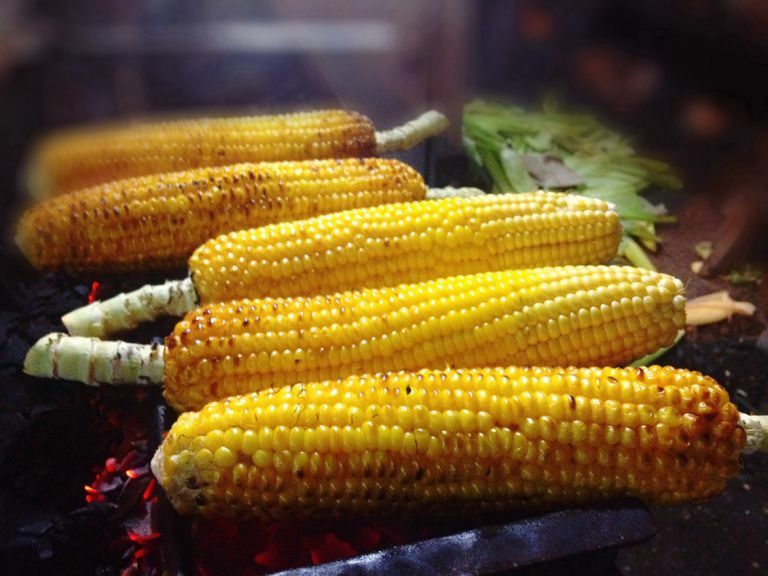 Shucked corn, meaning the skins and husks have been removed, can be grilled, boiled, microwaved, or steamed. If you prefer, leave the husks on for roasting or grilling. Grilled corn is a perfectly sweet, crunchy, and satisfying side dish. Corn is naturally sweet and doesn't need much flavoring to taste good. To avoid excess calories, sodium, and fat, keep your corn simple or add some flavor to it by dipping it in herbs and spices. Avoid topping your corn with creamy sauces and salt as 1 teaspoon of salt contains about 2400mg or about the amount of salt you need for an entire day. Avoid too much butter too. One tablespoon of butter will cost you an extra hundred calories and 11.5 grams of fat, and about 7 grams of saturated fat. If you are looking for a different flavor, simply baste corn with a smear of olive oil or roll into a variety of herbs and spices, dried or fresh, which add tons of flavor without sodium, fat, and carbohydrates. Some good ones to try include chili powder, jalapeno, cilantro, basil, garlic, thyme, paprika. You can get creative, too, by using corn as an addition to your meals. Sprinkle corn into a meal-sized salad to add a sweet flavor or use corn in soups, dips, or grain side dishes. Always remember to count corn into your meal plan as a carbohydrate source. From vegetarian dishes to meat and fish dishes, corn is a staple, versatile ingredient. Try it in pinto bean, corn, and avocado salad, stuffed peppers with corn, black beans, and pepper jack, and honey lime tilapia and corn foil pack. Labensky, SR, Hause, AM. On Cooking: A Textbook of Culinary Fundamentals. 3rd ed. Upper Saddle River, NJ: Prentice-Hall, 2003: 631-632,931. Spector, Dina. Business Insider. This multicolored corn is real and there's a fantastic story behind it.